Posted February 7th, 2018 by Vergo Network & filed under Ask Vergo. According to the American Academy of Dermatology, 50 percent of women between ages of 20 and 29 have acne. Another 25 percent of women between the ages of 40 and 49 are also suffering from acne. So why does acne affect women in menopause? It doesn’t matter if you are 20 or 49, the common root cause of menopause zits is hormonal changes. Hormonal changes usually effect the manner in which your skin regenerates and protects itself, which may sometimes lead to undesirable results. During perimenopause, the amount of female hormones i.e. progesterone and estrogen, usually drops. However, the amount of androgen hormones does not change during this menopause stage. This may lead to hormonal imbalance, that may lead to an increase in androgen hormones, that may cause oilier skin. When skin is oilier, it may clog your pores which causes skin to develop pimples. According to a question and answer done by the Mayo Clinic, it is likely that hormones lead to adults developing acne. However, hormones are not the root cause of adult acne. Adults are likely to suffer from acne when they have an underlying health problem. If an adult is experiencing hormonal imbalance as a result of suffering from a medical condition like polycystic ovary syndrome for example, they may have acne problems. The problem here is that it is difficult to measure hormonal imbalance – therefore difficult to properly diagnose and treat adult acne caused by hormonal imbalance. Why do women get acne with hormonal changes? Hormonal changes that lead to an increase in androgen hormones may lead to acne in women. This is because androgen hormones may interfere with the skin regeneration process and lead to an increase in skin oil. When this happens, the skin pores will be blocked, leading to acne. What hormones would cause acne? Also, if you have excess testosterone in the bloodstream it may cause your skin to produce excess skin oil which may block your pores. This problem is usually made worse by the slow process of skin regeneration in older women. Too many skin cells may block the pores that have already been clogged with sebum. This may result in skin infection and inflammation. Where in the body is acne most common? For some women, hormonal acne normally appears in the form of whiteheads, blackheads, or pimples that may appear on the lower face. 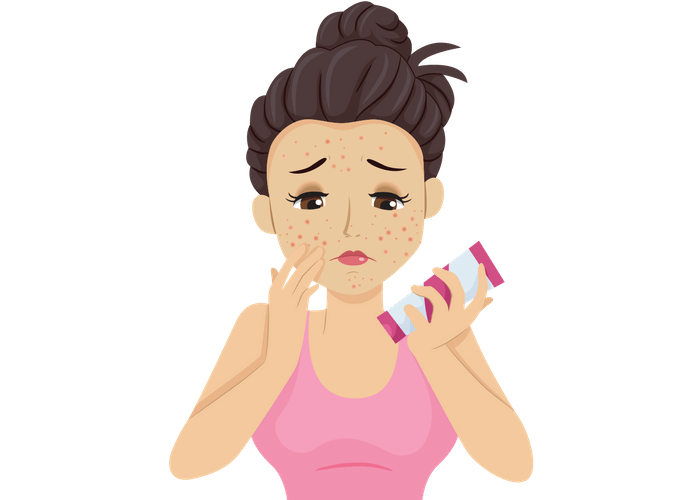 Hormonal acne may be caused by increase in hormones as a result of menopause, menstruation, polycystic ovarian syndrome or an increase in androgen levels. It is not advisable to use antibiotics or any other chemical products to treat menopause acne. (1) Using these chemical products can have harmful effects on your skin where it could burn while walking outdoors. (5) On the other hand, there are some companies that sell acne treatment products and claim that it is all natural. Before you buy any of these acne products, it is advisable to understand the claims made by manufacturers using ‘natural hormones removed from plants’. The chemical structure of plant hormones is different from the hormones we produce naturally in our bodies. There is no guarantee that when you use these products they will be effective at treating acne. Instead, consider changing your diet to treat acne during menopause.